Astari Nite is proud to bring to the world the music video to the title track of their second, and latest album, Until the End of the Moon. This is the 3rd music video for the album, following the music video for “Always Like Yesterday” and the live shot production for “Joyful Wish” which was shot at Revolution Live in Ft. Lauderdale while the band opened for She Wants Revenge. 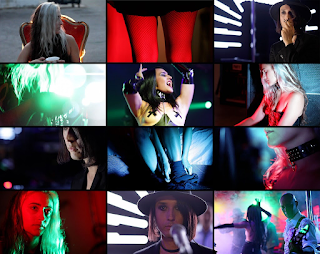 The video, directed by Charlie Tonelli for Beach House Productions, is a conceptual video, combining footage of the band setting up and playing live at th Fetish Factory’s Bloodlust party, as well as the adventure of the main character of the short film (performed by journalist Flor Frances), that’s making an effort to witness the band. Charlie wanted to explore with bursts of saturated color, and make the production reminiscent of Peter Greenaway or JF Julian’s styles.